Ian Muir’s life, apart from his family, is music. From the age of fourteen when he first appeared in the Gaiety Theatre, Ayr under the guidance of Bernard Cotton until today Ian has built up a reputation not only as a brilliant accordionist but as a performer par excellence. Over the years he has been a regular at the gaiety appearing with all the stalwarts of the Scottish variety theatre Including Johnnie Beattie, Rikki Fulton, Jack Milroy, Andy Stewart, Peter Morrison to mention but a few. His Scottish dance band formed in 1984 features regularly on BBC Radio Scotland’s “Take the Floor” and his many tv appearances include “Thingummyjig”, “Shindig” and “Northern Lights” as well as appearances on gmtv live at hogmanay. He is senior tutor at the prestigious Royal Conservatoire of Scotland, a post he has held for twelve years. Yes - Ian Muir’s life, apart from his family, is indeed music. I have had the honour and pleasure of working with Ian over the last nine years (and dancing to him for more). I run Scottish Dancing holidays both abroad and in this country (two/three a year) together with arranging dances in this country. I have been dancing for 50 years and would always choose Ian as my accordionist. His playing is second to none, his musicality a joy to listen to, his timing spot on and his stamina absolutely incredible – however long or varied an evening might prove to be. 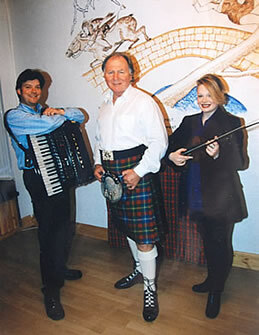 He is also able to call for ceilidh dancing, as well as playing the accordion. He is extremely flexible and easy to work with – able to change bars, dances or sections with no problem whatsoever. He is happy to play on his own where there is no doubt his own abilities and professionalism shine through or with other members of the band – to suit whatever the occasion requires. I have found him totally reliable – he arrives well on time, with no need to rush setting up the instruments and sound equipment – having travelled sometimes for hours but there is always a smile on his face when he arrives, throughout the evening and at the end. He is able to interact with the dancers – something that adds atmosphere and feeling to any dance occasion. Over the years my dancers have made comments such as “You would have to be dead not to enjoy this music!” and “This music takes you to another sphere”. Nobody has ever left my holidays or dances with anything but praise for Ian and his wonderful music. I could dance to him every night and still be looking for more – and sincerely wish I could be in that position. I enjoy every minute of working and dancing to Ian. On a strictly personal note he recently played for my niece’s wedding. There were 115 people there, 110 of whom had never set foot on a dance floor – let only a ceilidh dance floor. The atmosphere from the very first dance was electric, the floor was always full and everybody enjoyed a magical and memorable evening.